In 2016, the strategic goal for US foreign policy will be to finish the negotiations on the Transatlantic Trade and Investment Partnership (TTIP) agreement. According to media reports, the agreement will create a free-trade zone between the US and the European Union. Those countries are responsible for 60% of global GDP and 33% of global trade. Plus, the Trans-Pacific Partnership (TPP) agreement, which 12 states signed in Atlanta in October 2015, still needs to be ratified in order to take effect. The countries included in the TPP account for an estimated 40% of global trade. The US, which is responsible for approximately 10% of global trade according to estimates, has a role in both agreements. Thus, if both agreements take effect, these two transoceanic partnerships will control 73% of global trade. More precisely, the United States will control that trade. Of course, the entity known as the World Trade Organization (WTO) was seemingly created for the purpose of ensuring free trade. Currently 162 states are members of the WTO. From the very beginning, that organization (until 1995 it was known as the General Agreement on Tariffs and Trade – GATT) was designed so that a select circle of countries held the deciding vote on key issues. The US, Western Europe, Japan, Canada, and Australia liberalized world trade for the benefit of their own multinational corporations (MNCs). But in recent years that has become increasingly difficult. Negotiations have been underway since 2001 and developing countries are trying to make it easier for their own products (primarily agricultural) to reach the markets of Western countries, but after a decade and a half no progress has been made on the talks. It is getting harder for Washington and its allies to champion their business interests on global markets for goods and services. When Russia joined the WTO in 2012, this further complicated the West’s problems, in light of the possible creation of a BRICS bloc within that international organization. In 2012 Washington began to create platforms alternative to the WTO, in the form of two transoceanic partnerships, with the idea that the United States would dictate the rules of the game on these platforms, and the WTO has quietly become an empty shell. With such a maneuver Washington is counting on: 1) reviving its control over global trade and 2) economically weakening Russia, China, and other BRICS countries, isolating them from trading partners. There are frequent claims that the two partnerships being promoted by the United States will enable that country to establish effective control over global trade. But that’s not quite true. Three clarifications should be made. The first. Yes, the US, acting as a state, is the sponsor of both projects, but that state is working in the interests of multinational corporations (MNCs) and multinational banks (MNBs), and it is they that in the end will control world trade. And the US as a state will either waste away or be transformed into an empty shell like the WTO. The second. Not only trade will fall under the control of the MNCs and MNBs, but also the economic, social, and political life of every country involved in these partnerships. The states that join TTIP and TPP will lose most of their sovereign prerogatives. The third. In addition to two transoceanic partnerships, the master plan also includes a third element that is very rarely mentioned. This is the Trade in Services Agreement (TiSA). 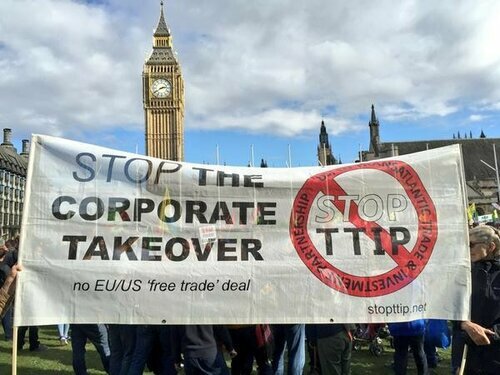 It is assumed that all countries that sign the TTIP and TPP agreements will also join TiSA. In their own way, TTIP and TPP can be seen as Trojan horses, but the Trade in Services Agreement looks like a weapon that guarantees final victory. «Final victory» can be understood to mean the total eradication of sovereign states. A year and a half ago no one had heard of TiSA. Information about the pending agreement emerged in the summer of 2014 on the Wikileaks website. That information indicated that preparations for TiSA had begun in 2012 and that the US and Australia had spearheaded the agreement. Gradually the circle of those taking part in the negotiations expanded. At the time the information was leaked, 50 countries (including 28 EU members) – altogether responsible for almost 70% of global trade in services – were already involved in the talks. There are three important facts to know about the preparations for TiSA. First of all, the TiSA negotiations are being held outside the orbit of the WTO. Of course there is the General Agreement on Trade in Services (GATS) that operates within the framework of the WTO. Considering that many unsolved problems remain in international trade in services, it would seem logical to address them by fine-tuning GATS. But the US and its allies decided that the WTO was cramping their style, and so they set up a parallel platform for negotiations. This has been the undoing of that organization that dates back nearly 70 years (GATT emerged in 1947). Second of all, there has been a stubborn refusal to invite Russia, China, India, Brazil, and South Africa to take part in the TiSA discussions. They were never even officially notified of the project’s existence. This was truly a policy of isolation, meaning that TiSA is intended to create confrontation, not cooperation. There is a good reason for Barack Obama’s claim that America cannot allow countries like China to dictate the rules of the global economy. After all, those rules should be dictated by the US. And third: until the summer of 2014, work on TiSA was proceeding in secret. And if the agreement is signed, its content will remain confidential for another five years. If it is not signed, the materials from the negotiations must still be stamped «classified» for five years. The game of democracy is over. The European Commission (EC) negotiated TiSA on behalf of the EU without approval from EU member states or the European Parliament. Until mid-2014, the European Parliament was never briefed about the TiSA negotiations, but in the summer of 2014, the Committee on International Trade (INTA) took an interest in the negotiation process, in light of the serious concerns that had arisen after the Wikileaks publication. Viviane Reding, an MEP, was appointed as the Rapporteur on TiSA. At a press conference on Jan. 13, 2015, she complained about the total lack of transparency in the negotiation process, noting that transparency was a key condition and that it was necessary to ensure that the European Parliament, social partners, and NGOs had a role in the process. Nevertheless, under public pressure, the EU member states formally empowered the EC in March 2015 to hold talks on TiSA. Negotiations are being conducted in Geneva. They officially began in March 2013. There have been 15 rounds of talks, the last was held in December 2015 and the upcoming 16th round is scheduled for February 2016. These meetings are chaired alternately by the US, EU, and Australia. Now memorandums and press releases are published after each round of talks, but those are empty pieces of paper, without content. Here is a list of the key elements of TiSA. First of all, TiSA stipulates that once that agreement takes effect, the rules of the game in the markets for services will be written not by national states, but by some supranational institutions. States are losing their right to pass any kind of law or regulation that would have a detrimental effect on business in the services markets. Second, the regulations stipulated by TiSA will affect not only the market for commercial services (transportation, tourism, hospitality, communications, consumer services, etc. ), but also the most important functions of the state. In TiSA’s terminology these are known as «public services». Third, TiSA stipulates that the state should gradually stop providing services to the public, turning over this type of activity to private businesses. Let me step back for a moment here. One you get the populace used to the concept of «public services» (the first step), later you can take the next step and convince them that they need to pay for these «services». Then the third step is to convince people that «services» do not necessarily have to be provided by the state, and that private businesses can do a cheaper, better job. And then private businesses will «efficiently» provide the public with housing and utilities, health care, education, and other services. And we all know how that works in the real world. Fourth, TiSA requires that the national market for services be fully open for the MNCs and MNBs to enter. As a result, the state – as a sphere of «common public interests» – should waste away. First TiSA destroys the social functions of the state (education, health, and public utilities), which will be handed over to supranational entities. Then state regulation of the financial sector of the economy will be eliminated. This primarily applies to insurance and banking. These must also be regulated by supranational bodies. TiSA requires the further liberalization of financial markets (despite the fact that the financial crisis of 2007-2009 demonstrated that this is a mistake). The most important aspect of the imminent financial reform (and global governance as a whole) is the full transition to a cashless economy. It is easier that way to manage the «consumption of services» by the public. It will be very easy to cut off from the system of «services» any citizens who have fallen from favor. Finally, information services (the media, Internet, and libraries) receive special attention. TiSA requires that the public be kept on a tight leash, through the use of information and communication technologies that will make it possible to monitor citizens’ compliance with the standards set by supranational institutions (the world government). 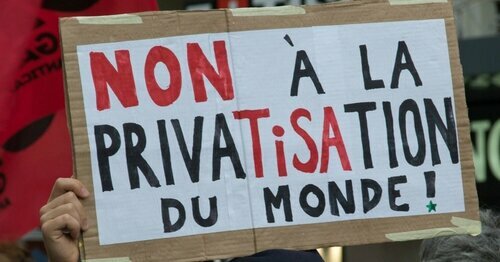 TiSA is actually a plan to privatize the state when it comes to social, financial, and information services. But it is not the masses of millions and billions of people on earth who will benefit from this project, but the families of the global oligarchy, who are constructing a planetary concentration camp in the name of «global governance». A look at the relevant documents shows that this is a plan by the financial oligarchy and the money masters to seize global power once and for all. There is no place here for empty debates about «democracy», «human rights», or «corporate social responsibility». Everything is rigid, exact, and serious, with incremental movement in the targeted direction. This project is the final transition to the new world order that resembles what George Orwell described in his novels 1984 and Animal Farm. The money masters are in a hurry. The Trade in Services Agreement is scheduled to be signed in 2020, but it is likely that that process will be accelerated.